A Christmas gift from my ever thoughtful mother-in-law, the new Nigella Lawson cookbook, Nigella Express, is everything I hoped it would be. I've always adored Nigella and her dreamy pandering of delicious foods. I love to watch her television show, shot in her home with clever camera angles and lots of blurry, dreamlike views. Nigella is not pretentious when it comes to describing what she's cooking. She's not in a big, well lit studio with everything at arms reach. She's running around her kitchen grabbing what she needs while telling a story about memories of her mother making the same heartwarming meal, then at the end of the show they show a dark kitchen and a nightgown clad Nigella sneaking to the fridge to lap up some leftovers. Talking through the entire show, it's as though you're right in the kitchen with her and you're going to get to taste that amazing looking pasta that she's dishing up for her children. Slightly exhausted of our recent bread and brie regimen (we bought cheese at Costco so we will be eating the brie for the next 10 years), I cracked open my new book. Inside I found the same unpretentious, inspiring advice about fitting time into each night to not only make dinner but make a dinner we would actually want to eat. 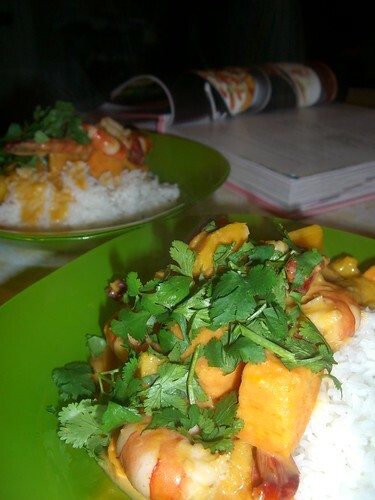 Tonight I served up Red Shrimp with Mango Curry over a bed of Japanese rice. It was quick and easy to make and I will make it again soon. There's a lot more exciting recipes too. A few that stand out in my memory are Broccoli and Stilton Soup and Instant Chocolate Mousse!